Ranjish.com has lots of Urdu Nikhat Iftikhar Poetry. Feel free to add your own Nikhat Iftikhar Shayari here. Nikhat Iftikhar is a popular poet from Pakistan. Some of her poetry became very famous and helped her achieve more in her career. We bring you the best Nikhat Iftikhar Poetry right here at Ranjish.com . 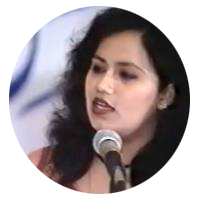 We update our poetry database on daily basis so keep coming back for more Nikhat Iftikhar.